The Big Game is now Bigger in Berkeley? From 2004-2009, Cal was the media darling of the Bay Area and suppose to be the team which supplants USC as the power in the West Coast. During that stretch, it was always a big precaution year after year and the coaches constantly needed to remind the players that this is still “The Big Game” and not to look forward to potentially Pasadena on New Year’s Day. Stanford, for most of those years, was the bottom feeder of the Pac-10 and it was easy to see given the lack of real competition and press received for the Big Games outside of 2009, why it would be easy for a Bears letdown (though as we find out, the letdown tends to happen the week following the Big Game against the Huskies). Outside of the collapse of 2007, Cal took care of business with ease most of those years including 2002 and 2003 when the balance of power was still in the process of swinging to the East Bay. Now it’s 2011. The roles have reversed. Stanford is now the up and coming team and Cal is now the program which is just happy to qualify for a bowl game. What used to be the biggest game on the season for those in Palo Alto, is now the biggest game for those in Berkeley. Neither Cal or Stanford, barring an Oregon collapse or some weird circumstances in the SEC and Big-12, will have made the Rose Bowl since Stanford’s appearance in 2000. The Cardinals still have plenty to play for though even though they are out of the National Championship discussion. With Boise State losing, there is likely only going to be 1 non-AQ auto-bid (more than likely Houston or maybe Southern Miss) which would leave 3 open BCS slots. While we know about Stanford’s small alumni base and the West Coast’s reputation of not traveling, the allure of the best QB prospect since John Elway and last year’s convincing Orange Bowl victory should make Stanford an attractive choice for the Fiesta Bowl even if they aren’t able to climb their way to #4 in the BCS from their current spot of #9. What does this mean for Cal? For the second year in a row, the Bears are in the unfamiliar position of playing spoilers in The Big Game. For the third straight year, we will be underdogs (+20 as of Wednesday in Las Vegas) and most of us will be happy if the game remains even remotely close. But this is why we play the game. I’m sure the seniors don’t want to leave with a .500 record against the Trees (.400 for Blueshirts) so if the Bears can’t get up for this game, I don’t see how or when they could ever play above the level of competition for a game. One upset (or two) in the final two games , coupled with a couple of UCLA defeats could dramatically boost the Bears from a low level bowl (such as the New Mexico or Kraft Fight for Hunger) to a more prominent bowl (Sun or Holiday). 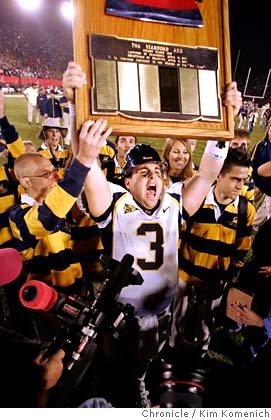 Cal fans who rushed the field two years ago when Cal upset Stanford 34-28 hope for deja vu this week in Palo Alto. If fans think it was crazy that year, imagine how nuts it will be if we can pull off the improbable.